Speaking at a Jewish law conference in New York City, Supreme Court Justice Antonin Scalia offered a window into his strict constructionist view of the U.S. Constitution, particularly as it applied to privacy rights. The American right to privacy is a complex and obscure right that the Judiciary should tread lightly when analyzing, Scalia suggested in a much-anticipated Wednesday speech at the Midwinter Conference of the Institute of American and Talmudic Law, a Chabad-Lubavitch organization that hosts continuing legal education courses. The justice system, he declared, is meant only to define the rights specifically declared in the Constitution and, if need be, to decide whether the legislature overreached in its interpretation of America’s foundational document of governance. “The vast majority of your rights are not constitutional,” he asserted. “Most of them can be taken away. Do I Have a Right to Read My Spouse’s Texts and Emails? Before getting into the core of his remarks, the Reagan appointee generally regarded as one of the most conservative members of the Supreme Court’s bench joked about his addressing the gathering; the justice is not Jewish. “I presume I am here to represent the American law perspective of this panel, as my recent Daf Yomi attendance has been lackluster,” he said, referring to daily study-cycle of the Talmud. Rabbi Shlomo Yaffe, who serves as dean of the institute – a division of Chabad of Midtown Manhattan – offered the Jewish take on privacy rights, which puts an onus on the holder of information to be responsible in its dissemination. “Western law is concerned with the rights of individuals, [whereas] Jewish law is more concerned with a person’s character,” he explained. “Torah law is concerned that you behave in the right way. Western law is here to protect you, lest your rights be violated. The panel that Scalia and Yaffe participated in read like a Who’s Who of prominent American lawyers. Joining the pair were Rabbi Michael Broyde, an Emory University law professor who sits on the Beth Din of America, the nation’s largest Jewish religious court, Jules Polonetsky, director of the Future of Privacy Forum, and Nathan Lewin, an attorney specializing in Constitutional law. In his remarks, Broyde looked at the American and Jewish legal traditions as two vastly different systems in the realm of privacy protections. Scalia, however, asserted that the two systems had much in common from the notion of responsibility, if not in the conception of rights. 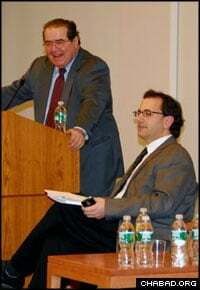 Lewin, whose long friendship with Scalia goes back to their days as law students at Harvard University and members of the Harvard Law Review, engaged in friendly banter with the justice. In one exchange, Lewin mentioned that the justice ruled against him in one of Scalia’s first cases as a judge on the U.S. Court of Appeals for the District of Columbia. For his part, Scalia pointed out that in another of Lewin’s cases, he ruled in favor of his friend’s client. That case, Goldman v. Weinberger, involved an Air Force clinical psychologist who as a religiously observant Jew insisted on wearing his skullcap while in uniform. Vikki Zeigler, a high-profile divorce attorney who served as a co-moderator at the conference, characterized the privacy debate as thought-provoking. “I think Justice Scalia has very strong beliefs and a very strong vantage point, and you have to respect that,” she said. Defense attorney Barry Slotnick, a faculty member at the institute, summed up the understanding one could walk away with from the conference.